Book Reviews - Men Alive! Here are some books that Christian men may find helpful, inspiring, interesting, or just entertaining. Please use Christian discernment when reading these books, since not every book in all its parts may agree with Scripture. Homosexuality—it’s a serious, sensitive subject. Emotionally charged, fiery rhetoric often clouds the clear testimony of God’s truth. Where can you find answers? In the book Forgive Us Our Sins. Co-author Scott Barefoot lived an actively gay lifestyle for a decade. But the Holy Spirit led him back to the truth of the Scriptures and to take his place at the foot of Christ’s cross as a redeemed and forgiven child of God. Each chapter of Forgive Us Our Sins tells a part of Scott’s story in the context of a study of God’s truth provided by Pastor Richard D. Starr. The authors avoid judgment and stereotypes by delicately balancing biblical law and gospel to provide encouragement to all believers who struggle with any temptation, not just homosexuality. Through the clear testimony in the book, you will grow in your knowledge and ability to speak the truth in love, to point to Christ’s forgiveness won on the cross for all sins, and to rejoice in the one thing that can truly change the lives of all sinners. The book provides hope and support for those who seek to turn away from a life of homosexuality. The book is only about a hundred pages and is a quick, easy read. This was purposely done so that the book will be read and used, and not just sit on a shelf. The cost is only $11.99, and is available at the Amazing Grace Bookstore, 1901 Broadway Street, Bay City, MI, (989) 894-5536. Will you be singing that hymn a few extra times in your congregation this year as you celebrate the 500th anniversary of the Reformation? What will those first two lines of the third verse mean to most of the people in the pews? What do they mean to you? I would have to admit that this is not the way I personally perceive my reality, my everyday life: that it is filled with fallen angels who, if they could have their way, would devour me and all that I hold dear. How often do you take that reality seriously? How often do the members of your congregation face up to this ever-present, world-filling threat? 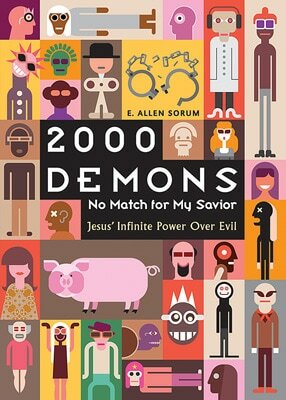 I am happy to have this chance to write to you a little about Professor E. Allen Sorum's new book, 2000 Demons: No Match for My Savior. It is written especially for the person who rarely thinks about the reality that there are many evil angels all around us who hate us a lot. I am very pleased with the work Prof. Sorum did in putting this book together. It is biblical for sure. It is multicultural, as Prof. Sorum shares stories from his travels with the Pastoral Studies Institute and his work with Christian leaders in cultures where demon possession is sadly common. It is serious, as the topic of demons requires it to be. It is personal, as Prof. Sorum talks about his own struggles to face up to the reality of demons. But it is also joyful, as the book drives home the message that Jesus and his gospel are far more powerful than even the largest legion of impure spirits hell could ever muster. Click here for a look inside the book. By means of periodic, contemporary personalized case studies, coupled with a perceptive investigation of the tumultuous events on the day of Jesus' "biggest exorcism" (Mark chapters 4-5), we are swiftly drawn into the serious issues that this study brings to our attention and how we may be equipped to deal with them, with an emphasis on the power of the Gospel and the committed prayerful efforts of fellow believers. Each of the seven, well-constructed chapters are followed by suggested "study questions," which makes the book ideal for an older youth or adult Bible study group. Contributing to this is its easy, engaging style--as if the author is speaking directly to his readers as he insightfully leads them through many different scenarios and situations. So, how do we deal with the Devil and demons in our daily world? Read this book--better together with others--and you (plural) will discover the answer as well as how to actively respond, in and through the all-conquering Christ (Mk. 5:19-20). May our matchless Savior, who came "to destroy the devil's work" (1 John 3:8), richly bless your ministry this Reformation anniversary year!